A radiotracer is injected into a peripheral vein. 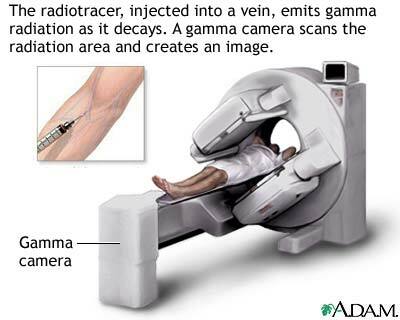 As the radiotracer decays, gamma radiation is emitted and is detected by a Gamma camera. When the tracer has collected in the target organ the area is scanned. Radionuclide scans can detect abnormalities such as fractures, bone infections, arthritis, rickets, and tumors that have spread, among other diseases.